Clustered and nonclustered indexes share many of the same internal structures, but they’re fundamentally different in nature. In this video, I compare the similarities and differences of clustered and nonclustered indexes, using a real-world example to show how these structures work to improve the performance of SQL queries. The tempdb system database is used for many purposes from materializing temporary tables to storing row version information for snapshot isolation. The default configuration of tempdb may not perform well for many production workloads. In this video, three important considerations to configure tempdb for optimal performance are discussed, including a more in-depth visualization about why creating more data files can be a big advantage. An advanced option I didn’t mention in the video is to enable Trace Flag 1118 (note: this trace flag is undocumented), which changes the allocation behaviour in tempdb to not use mixed extents. You can read more about this setting here. Sometimes 3rd-party applications store their data in SQL Server, and the client is left to manage the database themselves. In this video, I explore a few options you as a DBA have to manage the performance of the database, and offer suggestions for supported ways to improve the performance of both the database and the SQL Server instance used to contain it. Sometimes we face the requirement to search a table for a specific string value in a column, where the values are very long. The default answer is to create an index, but we must remember that index keys cannot exceed a 900-byte size limit, and LOB columns (which include the MAX type variants) cannot be in the index key at all. In this post, we’ll explore a method to efficiently index long character strings where the search operation is moderately-to-highly selective. Since we’re faced with a size restriction on the index key (or the string column cannot be included in the key at all), we need to apply some kind of transformation to the string data to make its representation — and hence the index key size required — smaller. Of course, we can’t simply compress an infinite amount of data into a comparatively very small field, so the index we create won’t be able to support all the same operations as if we had indexed the original field. But most of the time, that isn’t a problem — generally, we need to search for an exact match, or a string starting (or maybe even ending) with a given few characters. We’re going to do this by performing a computation on the original values, storing the result in a new column in the table, and creating an index on that column (there are two ways to do this, which we’ll get into shortly). In terms of the computation itself, there are a few different options that can be used, depending on what needs to be accomplished. I’ll introduce two basic approaches here, and then we’ll run through some code that demonstrates one of them. Use the LEFT function to grab the first several characters and discard the rest. This method is appropriate for both exact matching and wildcard searching with a few given characters (i.e., LIKE ‘abc%’), and because the original text stays in tact, it supports case/accent-insensitive matching without doing anything special. The drawback of this method, though, is that it’s really important to know the data. Why? To improve the efficiency of queries, the number of characters to use should be enough such that the computed values are more or less unique (we’ll see why in the example). It may in fact be the case that the original field always has a consistent set of characters at the beginning of the string (maybe they’re RTF documents or something), so most of the computed values would end up being duplicates (if that’s the case, this approach won’t work and you’ll want to use the other approach instead). Use a traditional hash function (such as HASHBYTES) to compute a numeric representation of the original field. This method supports exact matching (case-insensitivity with a small tweak, and accent-insensitivity with a bit of code), but not partial matching because the original text is lost, and there’s no correlation between the hash value and the original text. It’s also critical to watch the data types involved here, because hash functions operate on bytes, not characters. This means hashing an nvarchar(MAX) value N’abc’ will not give the same result as hashing a varchar value ‘abc’, because the former is always 2 bytes per character. Those are the downsides. The upside is that traditional hashing has the ability to work on data that contains very few differences, and when the text starts with the same sequence of characters. Both of these methods are hash functions, as they convert a variable length input to a fixed length output. I suppose the first approach isn’t technically a hash function because the input could be shorter than the number of characters desired in the output, but I think you see my point that both approaches “sample” the original data in a way that allows us to represent the original value more or less uniquely without needing to carry around the original data itself. Maybe it’s more correct to speak of them as lossy compression algorithms. In any event, I will refer to the results of these functions as hash values for the remainder of the post. Because this method omits some (or probably most) of the original data, some extra complexity in our code must be introduced to compensate for the possibility of duplicate hash values (called a hash collision). This is more likely to happen using the first approach as the original data values are partially exposed. It’s still possible, however rare, that the second approach can have duplicates, too, even if the input text is unique, so we must accommodate for that. Second, we need to make sure that the hash values represent a consistent portion of the string input values. HASHBYTES is great because it’s built-in, but its input parameter is limited to 8000 bytes. This means if the string values needed to be hashed are longer than 8000 char/4000 nchar, a slightly different approach should be taken. I would recommend creating a CLR scalar function, as there are no limitations of input size in the .NET hashing classes. Computed column. This method has two advantages: first, the SQL Server engine automatically keeps the hash value up-to-date if the source column changes. Second, if we use a non-PERSISTED column, we save the storage space for the hash values in the base table. The main disadvantage is that we may have to poke and prod our SQL statements to get the plan shape we want; this is a limitation of computed columns in general, not of what we’re doing here specifically. Note: if your goal is to create hash values in two tables and JOIN them together on that column, it may not be possible to do it efficiently using computed columns because of bizarre optimizer behaviour. Any time computed columns are involved, always inspect the execution plan to make sure SQL Server is doing what’s expected — sometimes common sense doesn’t make it into the execution plan that gets run. Base table column, updated by triggers (if required). This method works best to get execution plan shapes that we want, at the expense of a bit of complexity to keep the values updated, and the additional storage space required in the base table. In the example below, we’ll use the base table column method, as it’s the most flexible, and I won’t have to go into detail about hinting in the SQL statements. So we’ve got about 130,000 random-type strings, and then 3 rows which we can predict. Our goal is to efficiently find those 3 rows in the test queries. We get our 3 rows back, but this is far from ideal. I’m not sure why the optimizer chooses a scan and filter instead of pushing down the predicate into the scan operator itself, but that’s beside the point because this is an awful plan, with an estimated cost of over 3.5. Let’s move on and create our hash value column and populate it. Note that if you want to update the hash values using triggers and keep the column NOT NULL, you’ll need to add a default constraint so INSERTs don’t fail outright before the trigger code gets a chance to run. We got an index seek, which was the main thing we were looking for. The Key Lookup is expected here, because we have to compare the original values as well, and those can only come from the base table. You can now see why I said this method only works for moderately-to-highly selective queries, because the key lookup is required, and if too many rows are being selected, these random operations can kill performance (or the optimizer may revert to a table scan). In any event, we now have an optimal query, and even with the key lookups happening, the estimated cost was 0.0066, an improvement by over 500x on this smallish table. I’m sure at this point you can think of several other uses for this methodology; it can be applied to large binary fields, too. You could even implement it for cases where the column could be indexed directly (say, varchar(500), with most of the values taking up nearly all the allowed space), but maybe you don’t want to — hashing the data might save a significant amount of storage space, of course at the expense of code complexity and a bit of query execution time. While hashing data is nothing new, this technique exploits hashing to greatly improve the efficiency of data comparisons. I’ll leave it as an exercise for the reader to try the JOINing scenario I mentioned above — if you do, try it using computed columns first for maximum learning — you’ll find that this technique also improves the queries, as long as the join cardinality remains low (like in the 1-table scenario, to control the number of key lookups). 1 While I haven’t tested this in SQL Server either using HASHBYTES or a CLR function, there are implementations of certain hash algorithms in processor hardware itself. This may be of benefit to reduce CPU usage, possibly at the expense of storage depending on the algorithms in question. 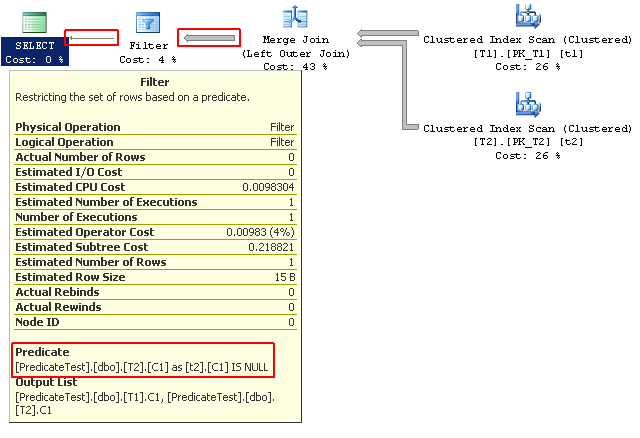 In a previous post, I introduced how to use startup expression predicates in T-SQL queries to improve performance. Based on the feedback I got, there was some confusion about what this operator actually does, and why it appears in the query plan as a Filter operator, which is usually seen in other contexts. In this post, I’ll explain the differences and similarities of the Row Filter operator (which is seen more typically) and the Startup Expression filter operator. As we can see, the query joined the two tables together, and then filtered that set of rows to give the final result. The Row Filter operator evaluated the predicate against each returned row (the big arrow to the right of the operator), and output only the rows where the predicate evaluated to true (no rows in this case; the small arrow to the left of the operator). This time, table T1 was scanned (20480 rows), and the Startup Expression filter operator was executed for each of those rows. However, the index seek to table T2 was only executed 10 times. How did that happen? The Startup Expression filter evaluated the predicate against each request row coming in from the upper input (in this case the T1 table scan), and only propagated the request where the predicate evaluated to true. This is how a Startup Expression operator “protects” or “guards” operators to its right, so they aren’t executed for every request row. While this particular example is contrived, it’s this “guarding” that improves performance by only executing the subsequent operator branch the minimum number of times necessary. 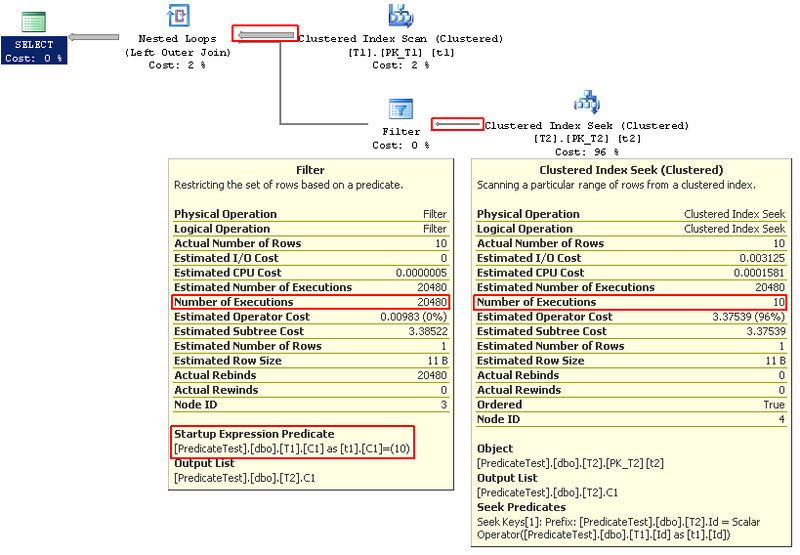 Both the Row Filter operator and Startup Expression filter operator evaluate a predicate against rows. The Row Filter operator applies the predicate to returned rows, returning only the rows that match the predicate, while the Startup Expression filter operator applies the predicate to requested rows, only making further requests when the row matches the predicate. While both operators perform essentially the same work (hence they both appear as a Filter operator), they do so logically reversed of each other, and therefore perform very different functions within a query plan.